Relaxing after a swim at Velma Lake. 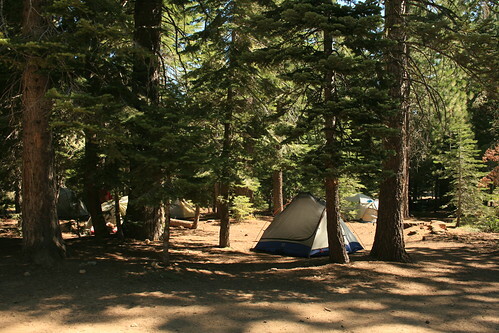 This past weekend I went on a camping trip to Lake Tahoe at Sugar Pine Point State Park with the graduate students in the Earth & Planetary Science Department at Berkeley, my new department. It was a lot of fun and I had a chance to meet a lot of people I will be working with and taking classes with. The first day we spent half of it driving there. Then after setting up our tents and stuff, we went to the beach to take a swim in Lake Tahoe. The weather was beautiful and hot, but the water was kind of chilly. 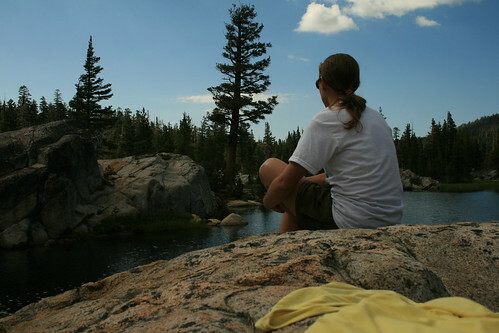 The next day we took a hike in the Eldorado National Forest in the Desolation Wilderness to Velma Lake. 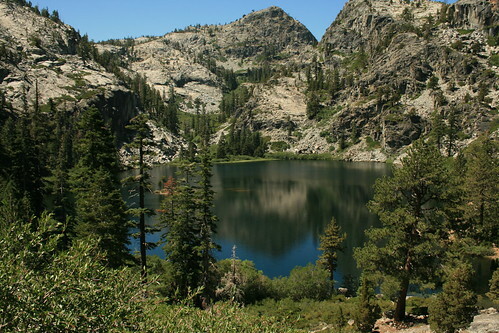 There is an upper and lower Velma Lake, and I'm not sure which one we actually hiked to. Once we got there, we took a swim and relaxed. It was a 10 mile round trip hike and a 2,000 ft elevation gain. Then the last full day we spent at Tahoe we took another hike to the peak of Mt Tallac, at 9,700 ft high, which was awesome! It was another 10 miles round trip hike but a 3,300 ft elevation gain. It was pretty steep in some areas but worth the hike to the top for the view alone. Near the top, which was above the tree line, there was a tundra like ecosystem with wildflowers blooming. It was so beautiful! 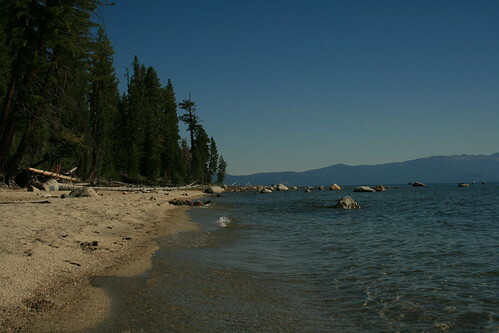 The shores of Lake Tahoe at Sugar Pine Point. My tent in the forested area of the group campsite at the state park. 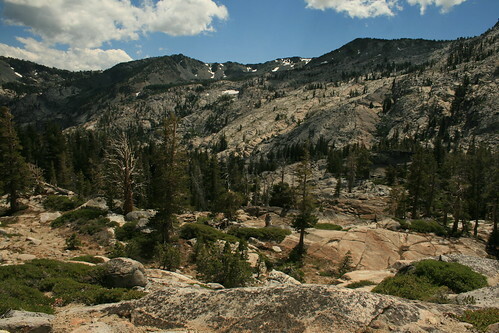 Eagle Lake, as seen from the trail to Velma Lake in the Desolation Wilderness. 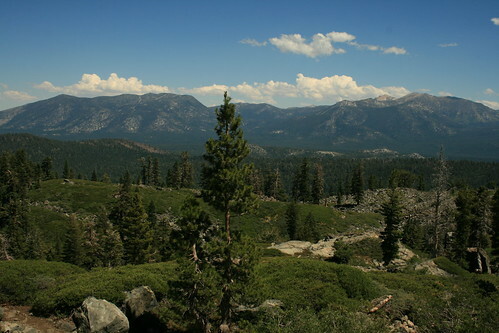 High Sierra beauty in the Desolation Wilderness. Gaining elevation on the hike to summit Mt Tallac. 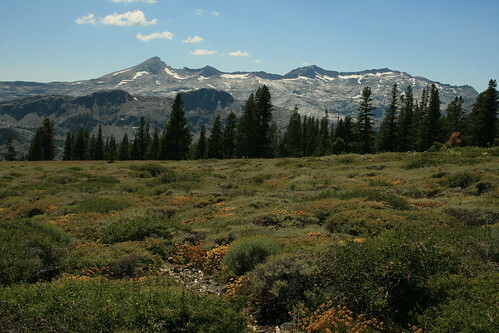 High Sierra tundra and blooming wildflowers near the summit of Mt Tallac. 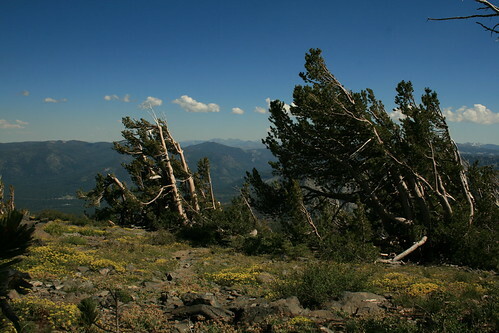 Trees sculpted by the prevailing winds, nearing the tree-line! 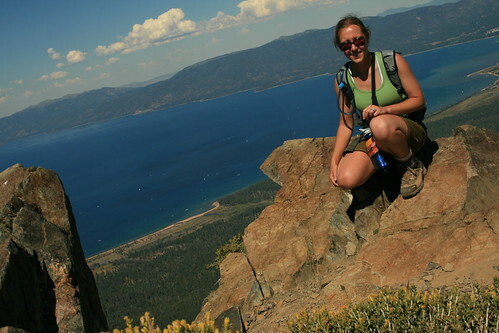 At the summit of Mt Tallac, with Lake Tahoe in the background.